In r cent years. there ha been increased emphasis on the management of a tirm ‘s assets. as m eured by the rate of return on as. ets. and the bon use of many managers are directly related to thi. measure. Ina. much a inventories arc: view ed a an asset on a firm ‘s balance -he t. the less inventory that i,>on hand, the better the return on a sets. To reduce invcntories without negatively affecting operations and customer deliveries. an increasing number of companies are using consignment inventories wherever possible. Consignment inventorie are inventories that are physically in a company facility but are still owned by the supplier. Thus. they do not appear an) where as an asset to the firm. 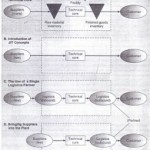 Only when the cornponents are actually used in the production of an end product does the ownership transfer to the firm. and then. it tran fers almost immediately to the customer upon shipment. Consignment inventories also are used in services. where the retailer doesn’t pay the rnanuta for the product until it is actually sold to the end user.